Victory Seeds are an emerging seedbank from the Netherlands who pride themselves on offering the most reliable and potent strains on the market. All of their seeds are bred from the highest-quality plants for optimum potency and aroma. Victory Seeds expertly select plants that are highly suited for medicinal use and always strive for customer satisfaction. 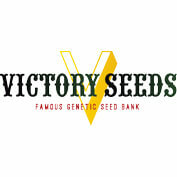 Victory Seeds focus and specialise in selective breeding of the worlds most famous strains. Their key focus is to take popular and award winning genetics and improve them as best they can, focusing on both THC and CBD levels, medicinal values, visual appearance, aroma, taste and potency. All of Victory seeds products are produced using only natural organic nutrients and insecticides. Their catalogue offers a wide range of Sativa, Indica and Auto-Flowering seeds. Victory Seeds believe growing seeds takes more than just time and money. It requires passion, patience, love, care and years of experiences gathered and turned into knowledge. Victory seeds strain hold the perfect combination of Strength, Power, Quality and Yield. All of their Original Genetics are fully stabilised and are always hand selected to ensure maturity and viability. All Victory Seeds are organically grown under strictly controlled conditions.